I liked it before, built 1936, 2,419 square feet, 1.75 stories. The lot is 0.2393 acre, about 50' x 190', flat. 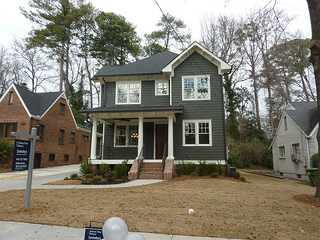 The new one was built on spec by Greystone Classic Properties. You build specs to a formula. They've got a pretty good formula for getting it built, getting it detailed for the street, and getting it sold. I'm surprised it didn't sell before it was done but I don't know how they marketed it. 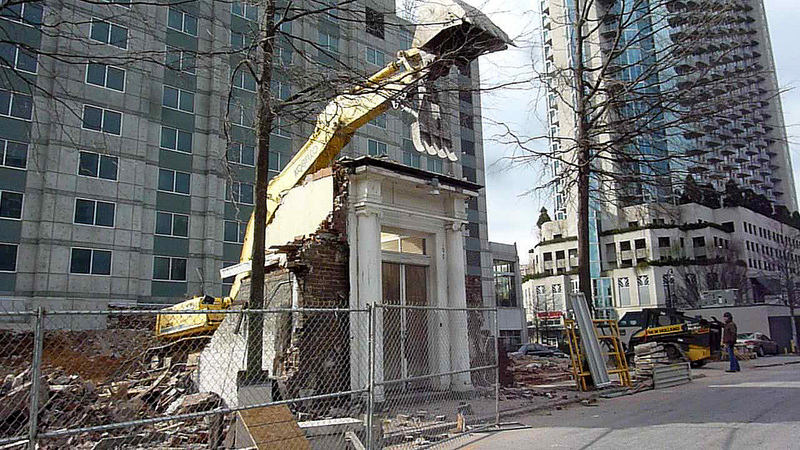 Major demolition started July 26, 2012, caravan was on January 29, 2013. Thanks to listing agent Erika Eaton for showing me around. Here is the listing. 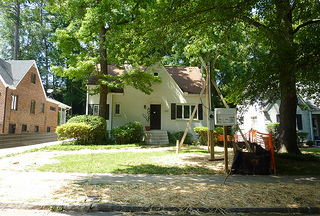 Breathing room: What I notice most is that the big tree is gone, the one way too close to the house. The trees at the sidewalk are still there. The permit box had been up for days. They took down the tree. One day the machine was just there. I could hear the crunching from my house that morning so I raced over. I joined neighbors across the street, we were throwing an impromptu wake. I leaned about the owner, the foundation cracks and the settling, the water problems, the teardown a few houses east. The yellow hanging bathroom Rauschenberg collage "got" me though. Empty lots can look so small. Here it is in context. The house to the right is closer to original. It's an antique market (Jan 31 - Feb 2), it's a one-day tour of homes (Sunday, January 27), it's an inspiration house (Jan 27, Jan 31, Feb 7, Feb 10), it's a major fundraiser. It's the happy design overload of the Cathedral Antiques Show and Tour of Homes.You should go. Angela at The Painted House has also blogged it. Lori at Lori May Interiors blogged it too. Ally at From the Right Bank blogged it. Terry's tips for enjoying these things: !. You can't see everything so visit every room, take a little break, then visit every room again. 2. Introduce yourself to the designer, few people can do this, fewer still have the courage to do it in public. 3. Ask the designer about their favorites or interesting things in the room. 4. Look closely at one little part of the room. 5. It's OK to ask "Could I afford that?" 6. It's inspiration, you don't have to live there. 7. Folks hog the designers, you should interrupt politely after little wait. 8. Don't hog the designers. Here is the plan of the Inspiration House. Here is my amateur Field Guide to the Designers. There are links to the details, professional pictures, and links to their websites. Hope it helps. Corrections welcome. Any more folks on Twitter? Brooke Merrill did the big foyer with 4 murals by Bethany Travis. Summer Loftin did the library, Ace Ventura territory. Elle Cantrell, Yvonne McFadden, Kate Stephens did the parlor as quiet and cozy with huge fireplace. Wesley Huffard did the dining room with the best fish plates you ever saw, look for them..
Karen Ferguson did the men's room and, as a guy, I approve. Louise Cronan the little foyer in blueish and red-ish, check out the chandelier. David Ecton and Lance Jackson did the white red and blue living room. Bold and red! Rick Anthony Bonner did the telephone nook. He's co-chair with Cindra of the Inspiration House and he's got duck. Jennifer Reine and, Robert White did the boardroom and dressed it in jewelry. Jenny Rothman and Warner McConaughey with HammerSmith did the kitchen with a major renovation. Dayka Robinson did the hall and the up stairway and it's not like the others. I challenge you to keep from smiling. Bryan Kirkland did the upstairs living & dining rooms with pop. Jonathon Gonzales did the upstairs bed and bathrooms with classic. Rogers King, Sarah Price, Duncan Spears with Eumenean Construction removed the upstairs kitchen. Lesia King also worked on the upstairs apartment with eye-popping art. Rhonda Peterson did the downstairs hall with angels, birds and trees. William McLure and Bill Ingram did the hearth room, a big renovation from what was a florescent lit office. Thanks to Cindra Brown, co-chair (with Rick) of the Inspiration House for her courtesy and hospitality. “There Are So Few Modern Masterpieces and We Know Them by Heart” Leon Krier at Georgia Tech. Thanks to my Blog, Twitter and Facebook friends for saying hello. I'd sure enjoy your comments. Tech usually puts these online. I'll let you know. 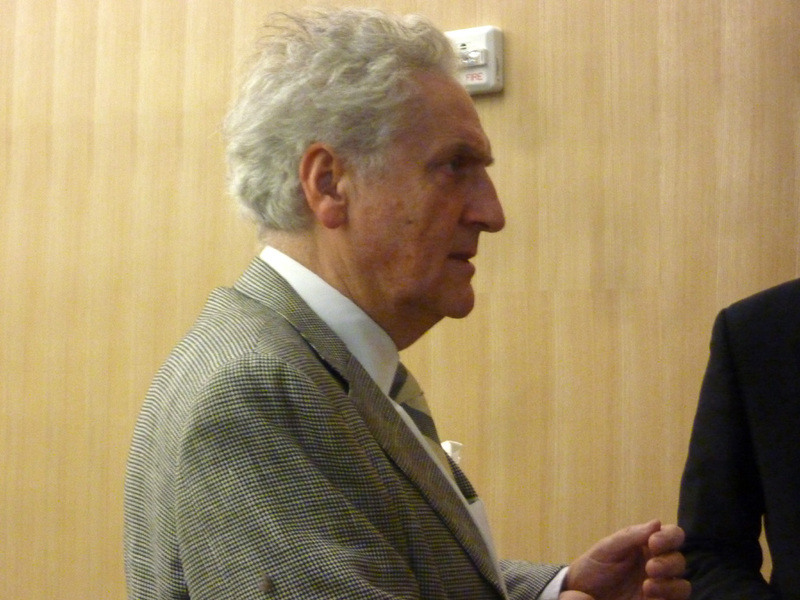 Leon Krier spoke last night at the Georgia Tech College of Architecture. It was the first annual Academy of Medicine Distinguished Architecture Lecture. You should have been there. I hoped Mr. Krier would attract outsiders to the Tech campus: folks who are interested in design, new urbanism, city planning, placemaking, traditional building. These lectures are usually cutting edge: Top international design talent discuss the the latest in everything. And this is a very challenging field. And honestly, they often talk in another language. Their presentations are provacative but rarely pretty. Afterward I sometimes need a translation and couple of aspirin. When I enter the auditorium, I'm always excited AND a bit wary. When I leave, I'm always happy I was there. Tech is loaded with design talent, both students and faculty. These folks are going to plan and design our future. After the lecture most went right back the studio. The lights never dim in the architecture building. Is new urbanist influenced planning is cutting edge? In any case it's easy for the layman to grasp. His slides didn't need any translation. Can you put Le Corbusier anywhere? Everywhere? The place filled right up. And for me it was one great aphorism after another. Like this: "Skyscrapers are vertical cud-de-sacs, only one way in or out." The Reinsch-Pierce Family Auditorium is a fine place for a lecture. Thanks to Jimmy Trimble & Betty Dowling (above), Gene Surber (below), and the rest of the Academy of Medicine Board for saving the Academy of Medicine, donating it to Georgia Tech and endowing the lecture. For Atlanta insiders: Do you recognize Gene Surber (center)? You are probably familier with some of Surber Barber Choate & Hertlein Architects' preservation projects and more. I recommend you subscribe to the Georgia Tech College of Archtiecture News so you won't miss any more of these. Léon Krier, Uber New Urban Provocateur at Ga Tech Wed 1-23-13 See You There? Do I need to tell you who Leon Krier is? He's un-bossed and un-bought. Expect fun, controversy, big slaps at modern architecture and urban planning. Expect new urbanism enthusiasts and a passel of architecture students. There might be cheers...and jeers. Expect to be energized. You should go. Better get there early. It's free. It's easy. Park free. Get there early and meet Ellen Dunham-Jones, Chairman of Congress for the New Urbanism. She's a Tech Professor and author. (Retrofitting Suburbia, Updated Edition: Urban Design Solutions for Redesigning Suburbs). We're lucky to have her in Atlanta. Drive to 4th and Fowler Street. Park underneath the tennis courts. I know there's a gate on the way out but it opens automatically after 6. Walk one block west on 4th to the Architecture Building which is on the right. P.S. If you are on Twitter, follow my New Urbanism List. If I'd known, I'd have gotten there earlier, taken some better before pictures. I've left some markers -"here's" - to say something but I don't have much to say. See Part 1. It began on December 17, 2012. 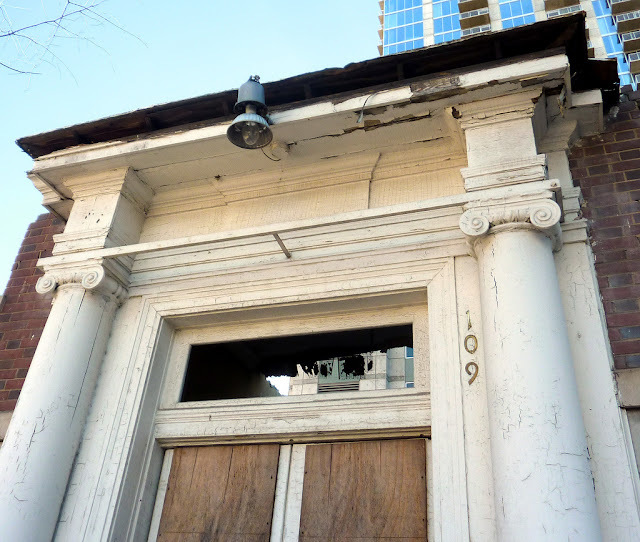 I got there on December 18: Demolition of 109 Seventh Street Atlanta, the J. A. McCord Apartment 1923 designed by Neel Reid of Hentz, Reid & Adler. It faces Seventh Street but it's just 50 yards from Peachtree. J. Neel Reid: Architect of Hentz, Reid and Adler and the Georgia School of Classicists by William R. Mitchell Jr.. If I'd known, I'd have gotten there a few of days earlier, gotten some better before pictures. I've left some markers -"here's" - to say something but I don't have much to say. See Part 2. There's SOMETHING over there. I was going from Howell Mill to Inman Park and forgot that Deering is closed. So I reversed course on 17th at Reservoir Drive. and decided to have a look. Does anyone know of Mr. Avery, how he lost his life? I can't find anything on the web. Every designer headed for Forsyth Fabrics, every with-it dinner headed to White Provision, every west side commuter has been here. We're on 17th just northwest of Ikea, at the intersection of Northside. The waterworks lakes are ahead and to the right. Even in the winter it's hard to see. But there's a flagpole in the trees.You'd never see this in leafy season. As you head west to where 17th T-bones Howell Mill, you catch something to the right. At 30 mph you can't tell what it is but it looks more organized than it should. 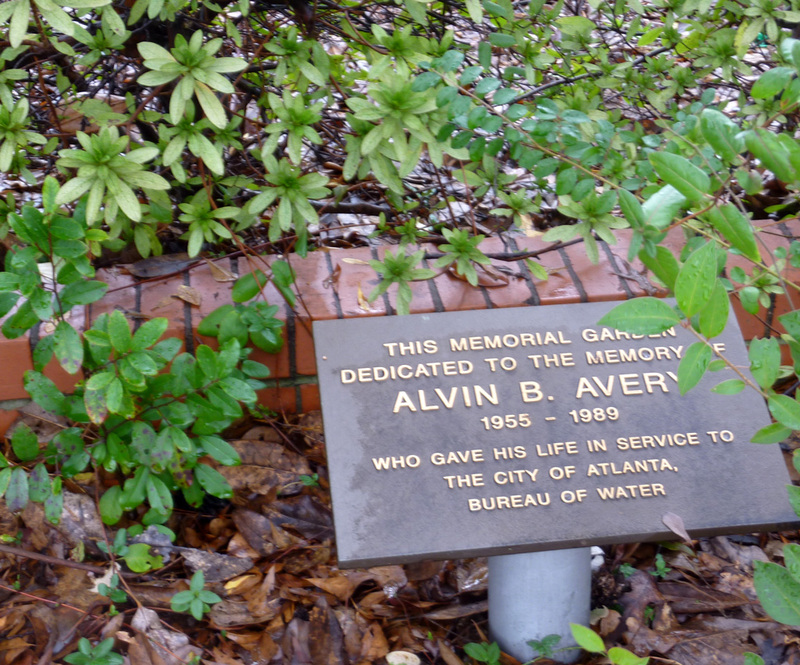 It's a memorial garden in this noble setting, a place of honor. It's easy to park here. It's quiet, as if you are in a secret place. There a lake to the west and a city view to the south and east. You are probably alone. It's so overgrown I couldn't figure out the design. I'm glad I payed my respects. ... That tiny park is surely a love story. I almost hesitate to question/research it. But "gave his life" sounds like he may have died on the job, in an accident at the waterworks. I shall keep looking, I've alerted my brother who worked as a land planner for many years in ATL. Determined to find a published obituary, back later when I locate one.